Mum worries freezer-raiding burglars ate placenta: "We're very much disturbed"
It seems the freezer-raiding bandits from Auckland may have got more than they’d bargained for. That frozen hunk of protein was most definitely NOT fillet steak. Auckland mum Loralie Burns’ home was burgled at the exact same time her son’s frozen placenta went missing. Luckily Loralie’s a clever (mystery-solving) cookie. Putting two and two together, she fears the culprits not only stole the placenta, they may even have eaten it. Gulp. Literally! She pleaded with the robbers to return the placenta, via a post on Facebook. 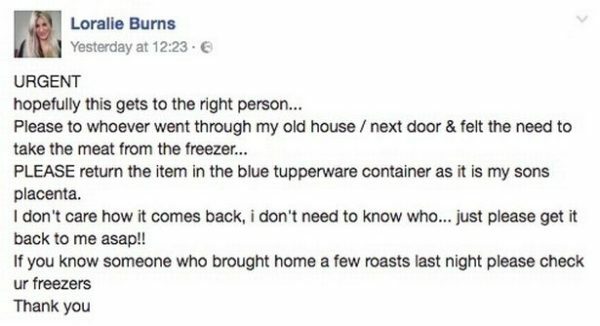 “Please to whoever went through my old house / next door & felt the need to take the meat from the freezer,” she urged. “PLEASE return the item in the blue Tupperware container as it contains my son’s placenta. If you know someone who brought home a few roasts last night please check your freezers,” Loralie warned. The new mum explained she was in the process of moving house but had left a few items, including the washing machine and fridge, at the old property overnight. The (demented) thieves ransacked the house, taking what they could, including numerous bits and bobs from the fridge. Unfortunately for all involved, the baby-sustaining-organ was included in this ill-gotten booty. The placenta had been stowed in a plastic container in the freezer since Loralie’s little boy Dante was born five months ago. Loralie had hoped to bury the placenta in a special ceremony to celebrate Dante’s birth. The hungry thieves have waylaid her plans, and possibly gained a fortifying hit of essential vitamins and minerals in the process. “We were going to bury it with my partner’s mum’s ashes, somewhere really special. We’re very much disturbed,” the concerned mum explained. A gobsmacked Loralie told Stuff NZ that the placenta was not the only complicated treat that’s gone missing from her fridge. The robbers have lifted quite the delicious feast. Not. Loralie says she’s worried that the robbers have made a meal of something that’s really a part of her. “I hope to God I get it back, and I hope no one eats it – that would torment me for a long time. I presume the only reason they stole it would be to eat it,” the disturbed mum said. Loralie has a serious, yet forgiving, message for the ransacking ratbags.